If you didn’t like “Us” is it because you’re not sophisticated enough to have gotten it? The quick answer is no, of course not. But let’s unpack this movie, and why that’s a question surrounding it to begin with. First off, I love Us. I love that it revolutionizes the horror genre, that it centers Black people who survive, that it’s casually broken more than a few records. It has the biggest opening weekend for an original R-rated movie, the biggest opening weekend ever for an original horror movie, and the biggest opening weekend ever for a movie starring a woman of color. The list goes on. Fans and detractors of Us must agree to respect its place on the shelf next to historical timepieces in Black entertainment. But did the plot click? Some of it did, indisputably. A more reasoned question is how many parts of it clicked, how many didn’t, and if the reasonable parts outweighed the confusing ones. Us is an intricate film. For all its elaborate set pieces, there’s lots of imagery, micro-commentaries sprinkled throughout, and a killer twist ending that so much as drags you back to the theater for a second viewing. Bolder than its imagination is the way the movie empowers its Black characters — a major subversion in the horror genre that feels almost too good to be true. It was the moment I watched Zora beat the tethered twin sisters senseless with a golf club that it clicked. Us is as much concerned with its role in social and cinematic revolution as it is its own internal logic. Peele re-visits the reparation set piece (a la Chris’s classic escape from the Armitage Estate in Get Out), but this time wedges it right in the middle of the film. It doesn’t determine the fate of the narrative, but it changes a narrative, one much bigger than the film itself, about how the horror genre brutalizes and devalues the Black body. Once the Wilsons enter the Tylers’ home to kill their doppelgangers, all those awkward beach interactions between the Black family and the white one make sense. Initially, watching the “friendly” families interact is cringe-worthy. There are barbs in the small talk, but just like the characters, we have to pretend they’re not there. The “tethered” parallel of that small talk is the two families literally trying to kill each other. And underneath, that’s what it was all along, right? Adelaide is quick to drive her poker into the head of Josh Tyler when he answers the door in his “tethered” red jumpsuit — no questions asked. We know for a fact these families never actually fucked with each other. Ever-so-socially-respectful Zora didn’t like the stuck-up Tyler twins, who barely acknowledged her presence when she arrived at the beach earlier, and then badmouthed her little brother to her face. But we didn’t think we’d get to see Zora beating them to death with a golf club later. Seeing Zora swing that golf club and hit her target without being harmed in the process is vindicating. Peele empowers Black folks by lifting us out of the “meaningless sacrifice” box we’re so used to filling in narratives tonally similar to this one. As for the plot itself, Us has ideas. Ideas that make the pacing feel slow, and then fast, and then slow again, as they’re introduced and executed. With more detailed explanation about what was actually going on, we would’ve left the theater more assured about our true opinions on the story. There are more than a few questions that come to mind about what was really happening. Why did the government leave the clones below ground? How did tethered Adelaide manage to assume control over real Adelaide’s behavior after they switched places? There seems to be supernatural answers existing in tandem with reasonable ones. The true answers encompass some real world logic, and some suspension of disbelief. It makes sense for a movie that’s home invasion, slasher film, psychological thriller and social satire all at once. I wonder if it matters that not everything here is tethered to logic. Jordan Peele is a satirist. His artistic compass leads him to the conceptually large, the barely fathomable. He transcends logic because bending to it would imprison the statements he wants to make and the artistic risks he wants to take. There is one theme I wish was more explored. The idea that we horrify ourselves — that we are our own worst enemies, as the prettier, more public parts of our psyches are at war with the uglier, more private ones. It is there, in the subtext, the visuals, and briefly in the narrative, but the story’s sci-fi spin keeps it from fully forming its statement in the psychological. Maybe that merging of ideas is the point. 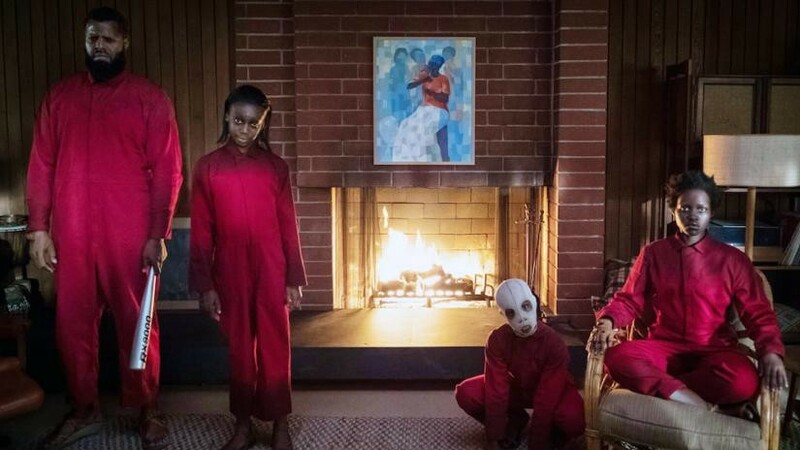 What’s most valuable about Jordan Peele as a visionary is that his work tethers the real to the unreal. It takes big risks to reveal even bigger truths. It imagines us into an unfathomable world, with unfathomable circumstances, and then dares us to claim it as our own.